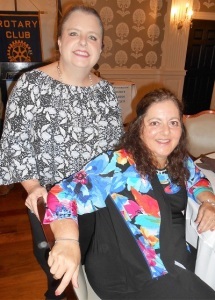 Capital Rotarians heard the story of a unique boutique that helps cancer survivors feel whole again from the business founders – Sherry Norris (standing in photo) and Kim Neel (seated) – guest speakers at the club’s Oct. 10 meeting. The pair opened Alala LLC in 2006 to serve women who’ve had all types of reproductive cancers. The company specializes mainly in mastectomy prosthetics and bras, as well as compression pumps for cancer survivors. Alala also offers compression garments and wig refurbishing, shampooing, conditioning, setting and styling. In addition to their retail operation, Norris and Neel started a nonprofit organization in 2008 – the Alala Cancer Society – that helps provide women with donated mastectomy bras and wigs that would otherwise be unaffordable. The enterprising pair met while working with the local Girl Scouts and remain active community and church volunteers. Norris received business administration training at Georgia’s Kennesaw State University, while Neel earned a bachelor’s degree in business administration from Lenoir-Rhyne College in Hickory, NC.